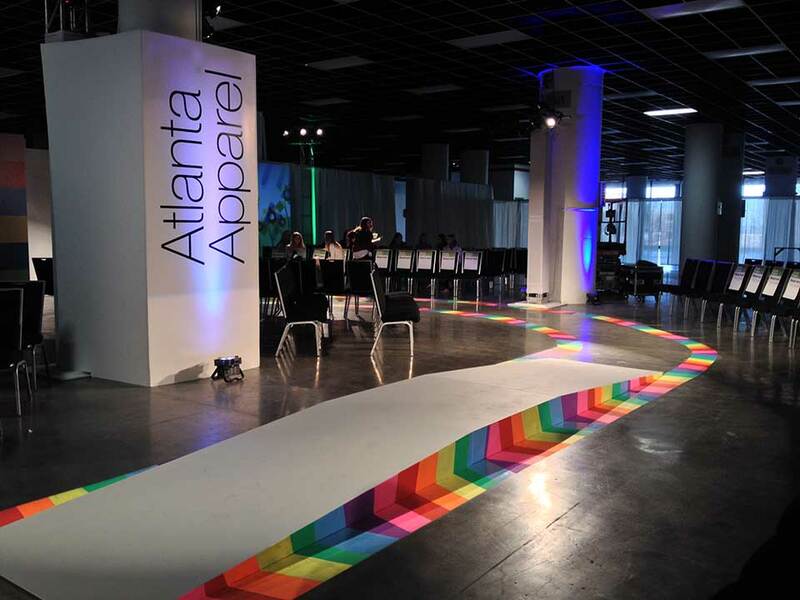 Three of our chalk artists, Katie Bush, Meg Mitchell and Jessi Queen, were commissioned to create a runway out of chalk for the Children’s Hospital of Atlanta Benefit Fashion Show to be held at their America’s Mart event space. The project offered a unique challenge because the chalk had to come up afterwards. Fortunately the event space had a smooth polished floor which makes cleanup easy. 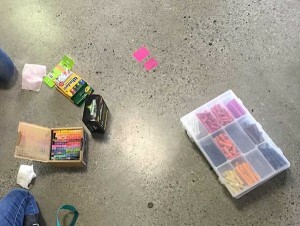 A selection of chalks being tested at America’s Mart. 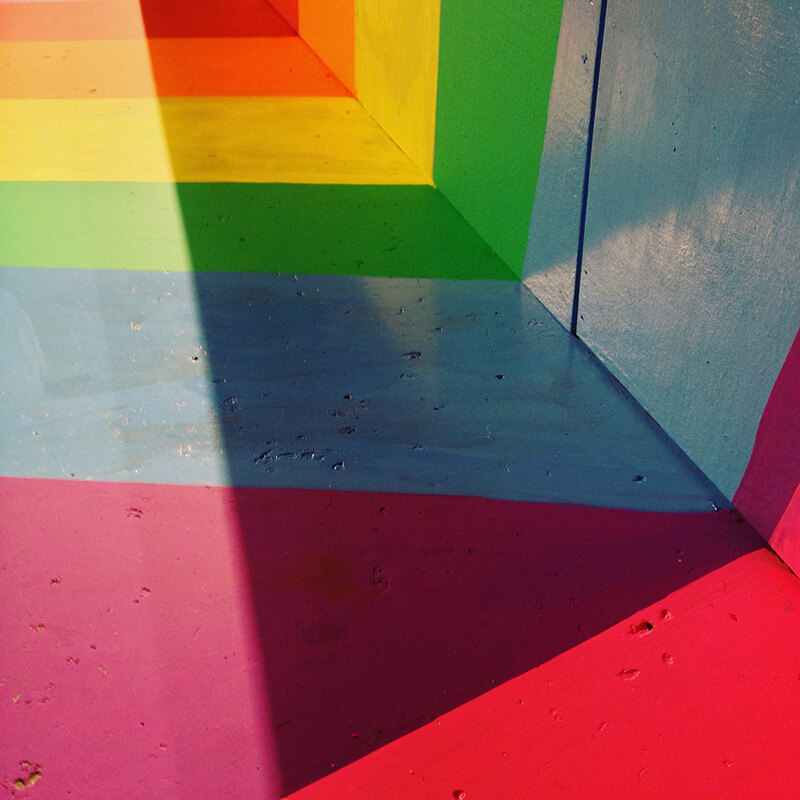 The artists went to the location to test some materials and determine whether or not chalk or paint was going to be the preferred medium. 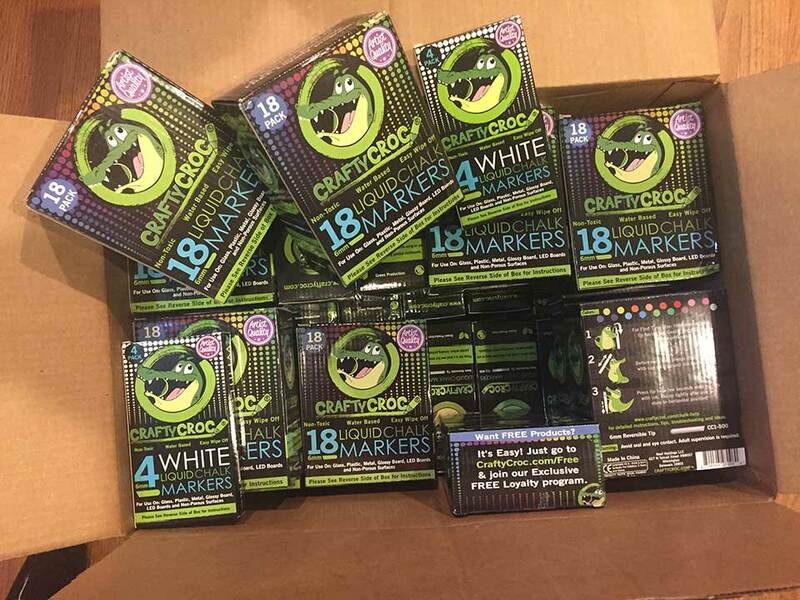 They tried several brands of chalk: Prang Freart chalk, Koss, and Alphacolor. The surface was too smooth to grip any of the chalks and hold any color. Generally the next step would be to try something like tempera paint to give the surface tooth, but there were some misgivings by the client to try paint, so before trying paint, they tried chalk pens. The chalk pen solution worked. The color was vibrant and seemed to remove easily once dried. They created several patches of color to test over several days to make sure removal wouldn’t be a problem. In short, they appears to have a winner. While determining the material that would be used there was also a lot of preparation work to finalize what the team would draw at America’s Mart. 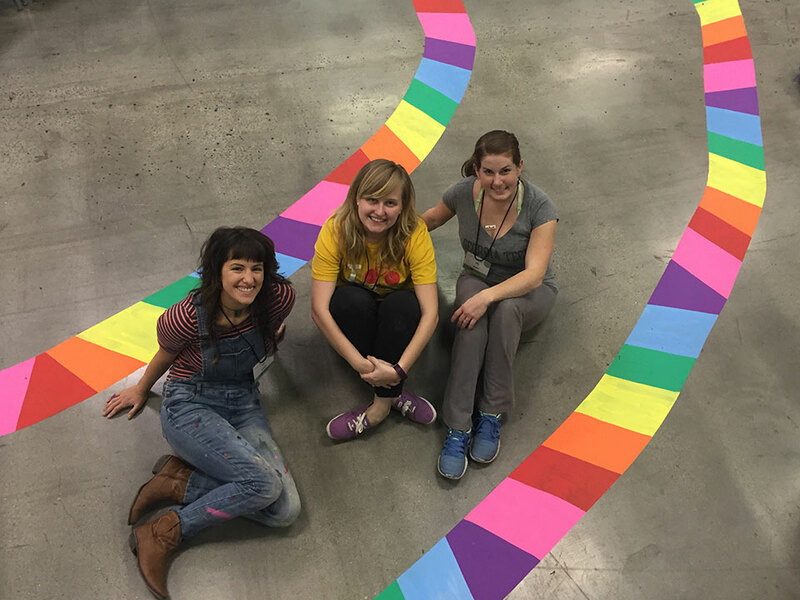 Initial designs included a scenes with oversized candies, rainbows with clouds, a yellow brick road, and gigantic flowers; everything was intertwined to create a fantasy walkway fit for a dream. Jessi used photoshop to aggregate all the ideas that she, Katie, and Meg ha . 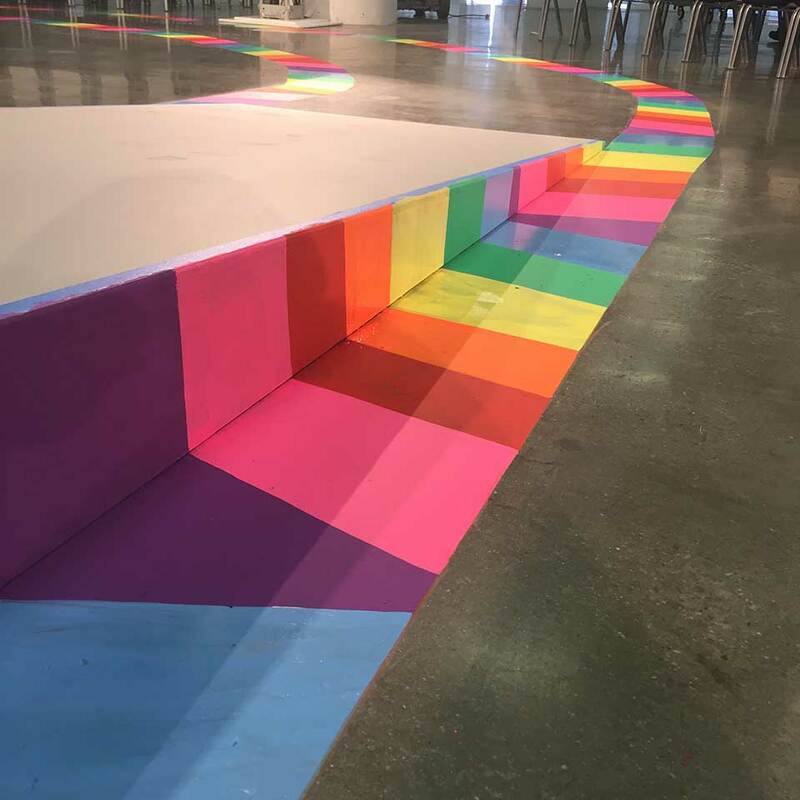 The week of the event the design was updated with a simplified vision which was inspired by rainbows and focused more on color. The final composition was well received and final preparations were made. The team ordered a sizable amount of Crafty Croc cover the full runway. 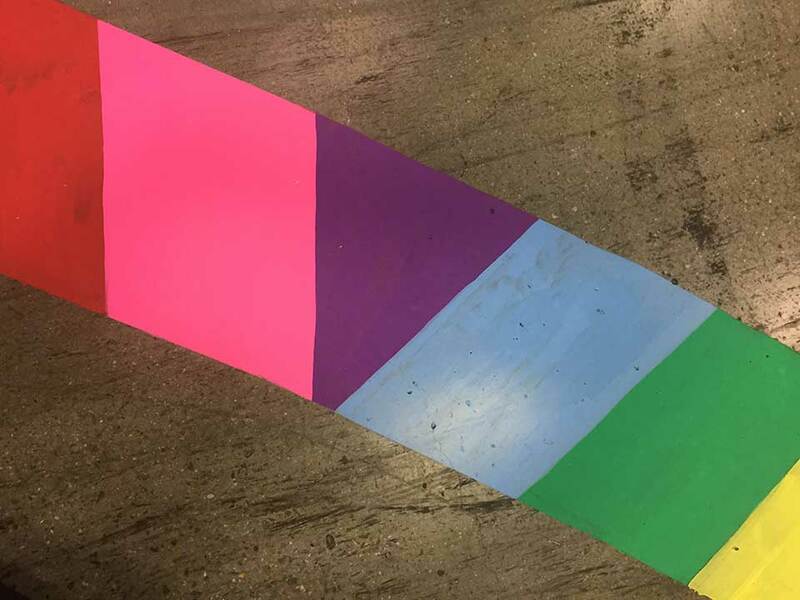 Meg had experience drawing on the floor when she worked at Whole Foods and came up with a plan to empty the pens into paint containers and paint the colors on. The process was simple but required a good pair of pliers to snap the markers. 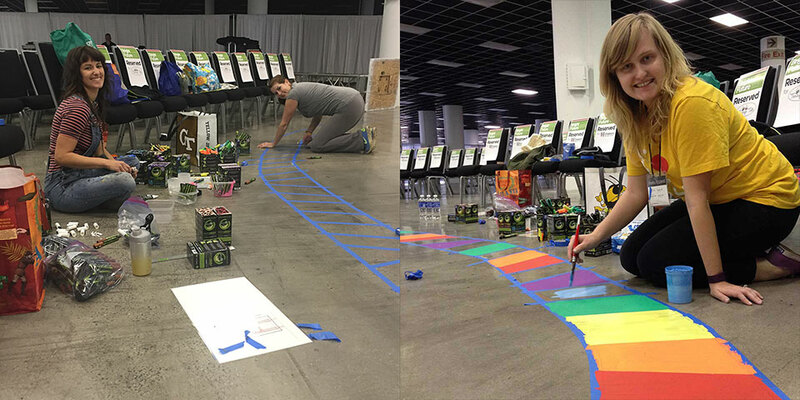 Working as a team they masked out the runway using several rolls of blue painters tape and plotted out where the colors would go. Once they determined their process they were able to make good time; they made a great team. When the children arrived they were very excited to see all the colors. Since it is just chalk paint it would rub off very easily. Walking on it would definitely scratch it. The woman in charge told all the kids that it was hot lava and not to walk on it. The whole thing turned into an exciting game for them. The artists were not able to attend the show but they did see the joy the chalked runway brought the children during their practice. The hard work resulted in a stunning walkway and the project was a great success! 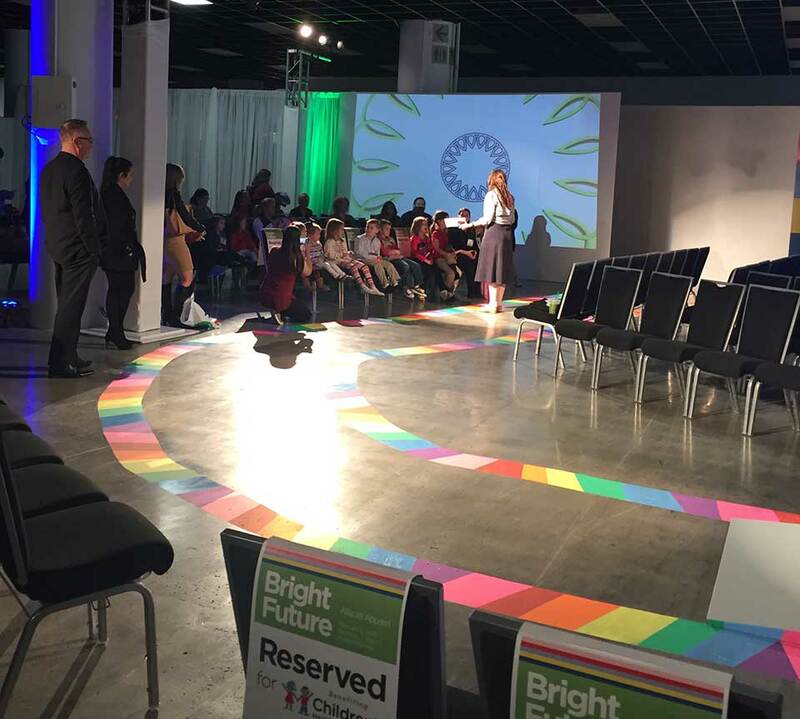 Children sit waiting for their performance in front of the completed chalk runway. A closeup of the chalk runway. A detailed closeup of the bridge. The bridge wall also has chalk to match the floor. 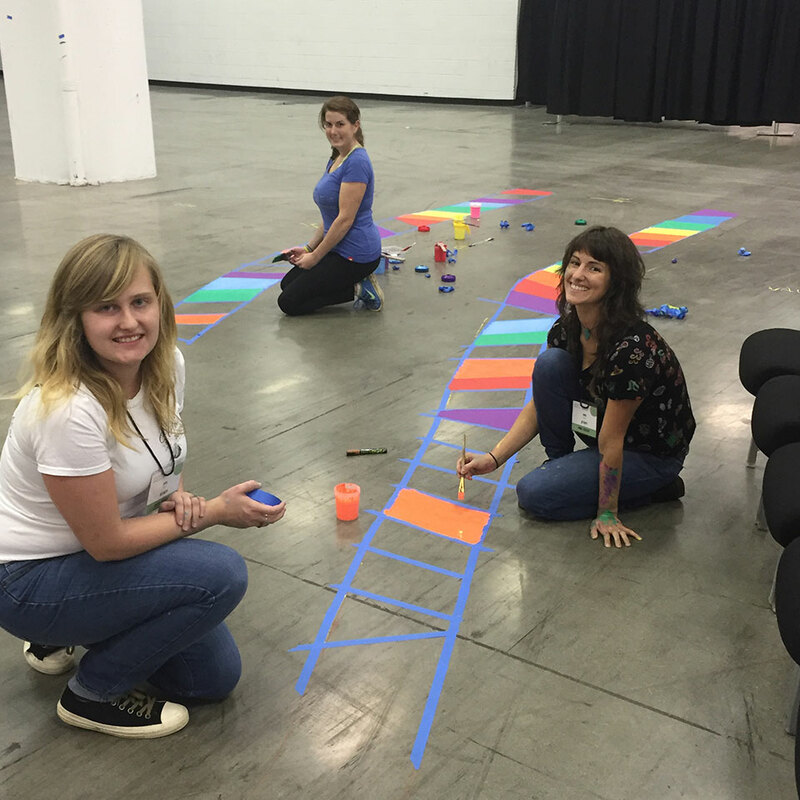 Katie and Meg masked out the squares while Jessi paints the chalk pen. Chalking in progress. From left, Jessi, Meg, and Katie. One of the men hanging lights offered to get a nice photo of us from a bird’s eye view. From the left, Katie, Jessi, and Meg. 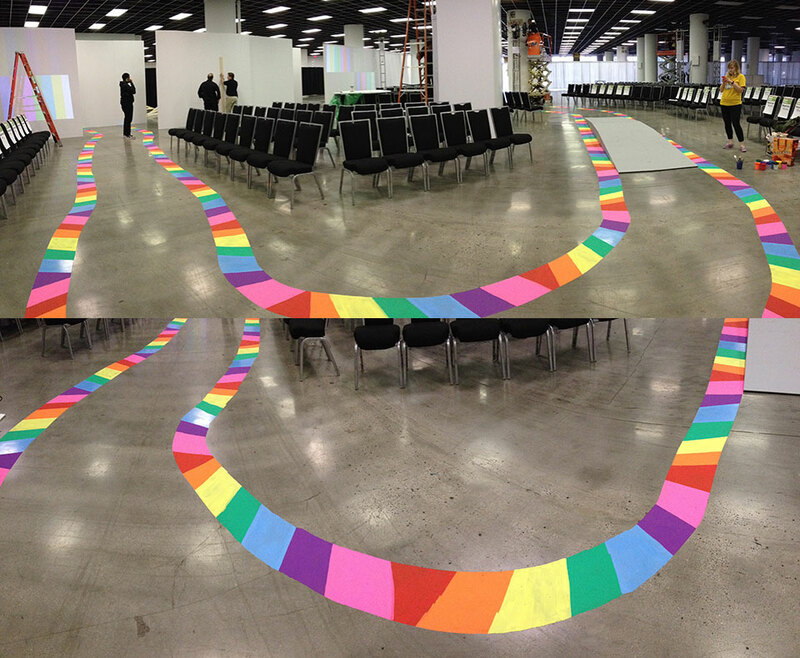 With lots of patience and chalk paint, it became a winding rainbow road for the kids to walk down.